There's something about beer that turns me on. Thinking about it lifts my spirits. That's silly, I know. I guess I love beer people; the ones I've met are generally a fun bunch. This image of carefreeness is most likely the reason I do things with much gusto when beer is involved. Or maybe it's just a bit of alcohol talking. A little beer in cooking does no harm. It's like adding coke into chicken. I'm infusing it into a pork belly dish here. It was so yum that I'm itching to cook this again, but as they say, you can't have too much of a good thing! It's a necessary evil to balance our meals out with healthier meat cuts. Pork belly is high in fat. Although I like beer, I have never gone beyond a glass at any one time. I admit to being a lousy beer drinker, but I have always enjoyed things in small doses. For this recipe, I went with Carlsberg - a light, pleasant beer. I didn't want it to overpower the dish, but to each her own is my take on this. Use any beer you like! 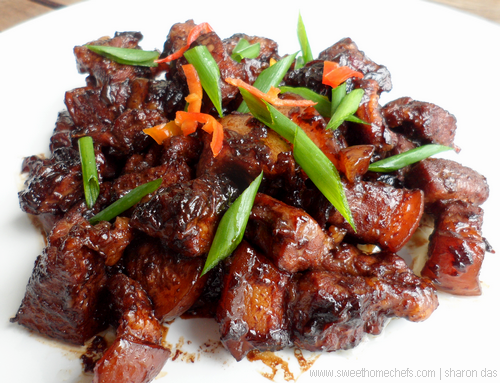 1) Mix pork belly with jaggery and dark soy. Leave aside. 2) Heat oil in pan. Pan-fry the pork pieces for a couple of minutes. 3) Add the garlic. Fry it for a bit. 4) Then pour the beer in along with some water. Cook covered on low heat for about 15 minutes. 5) Remove the cover and cook on high heat until the sauce is reduced to a glaze. At this point, the pork belly is sweetish. Season with salt for a savoury oomph! 6) Give it a good stir. It's done. Serve garnished with chilli and spring onion. Best eaten fresh out of the pan, with rice or on its own. It's great with congee too. 5) Finally, pour the beer in! 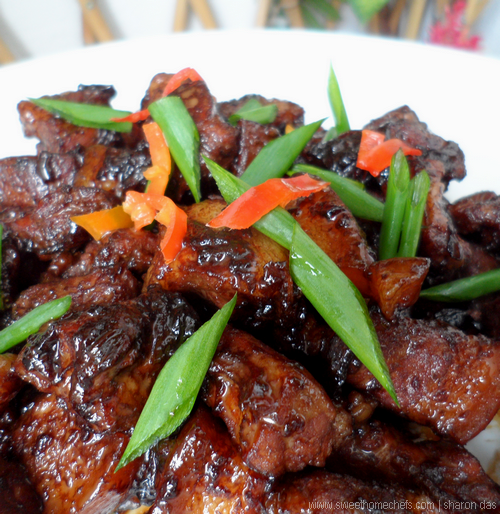 Beef is a taboo for us, still, this is lovely dish. I am sure the taste wouldn't be compromised if I use chicken or lamb as well. So delicious! I haven't had pork belly in ages..now you have me seriously crave some! Thank you, Angie. This is something I can easily overeat. I'm sticking my tongue out on this one! Aww...you made my day ..
Rice wine sounds amazing. 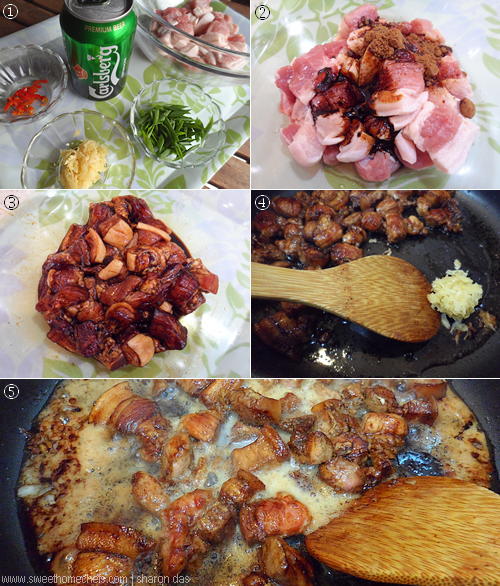 I've always cooked chicken with it, but have never tried it with pork belly. Now that you've put the idea in my head, I shall do this one day! Wow! Sharon ! You set me drooling just by looking this dish of yours ! Cold beer with peanuts? Ooo..now that sounds good..
Wow! This braised beer sauce looks real fingers licking good... yum yum! This is simply delicious to go with white porridge in this hot weather! Chicken Satay Pizza - The Shortcut!